The 52nd session of the UN Economic Commission for Africa (ECA) is convening in Marrakech from March 20 to 26 under the theme: “fiscal policy, trade and the private sector in the digital era: a strategy for Africa”. The event is an opportunity for African ministers to discuss the fiscal policies necessary for the implementation of the African Continental Free Trade Area (AfCFTA) within the frameworks of the 2030 Agenda & Agenda 2063 and the critical role of private sector in the era of the digital economy. The AfCFTA could soon reach the minimum required ratifications to come into effect since 19 countries have already ratified the agreement. With three additional signatures, the agreement could come into effect. In opening remarks, Executive Secretary, Vera Songwe, said the ability to increase revenue collection was key to the continent’s capacity to finance its development, in particular Agenda 2030 for sustainable development and Africa’s Agenda 2063. A typical economy on the continent, she stressed, collects just about 16 pc of GDP in taxes, with the exception of countries like Morocco, which collects at least 25 percent. “However, ensuring the availability of adequate public resources and quality investments to drive structural change requires responsive policies that promote fiscal sustainability, optimize returns from economic activity, and enable economies to fully participate in an increasingly interconnected and globalized world”, underlined Mrs Vera Songwe. “We are looking for how we can finance better, faster and more equitably our growth and how we can ensure that our young populations can participate in this growth that we are talking about. We can do that by ensuring that we have good fiscal policy. We would want to be like Morocco at 25 percent so we can actually power growth”, she said. Speaking during the meeting, Zouhair Chorfi, Secretary General of Morocco’s economic and finance Ministry, said digitization is a great opportunity for Africa. 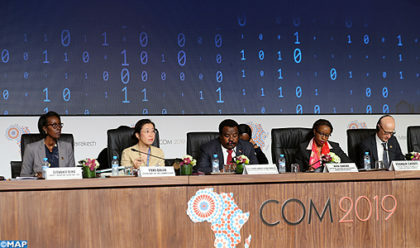 “Our continent is ripe for transformation and Morocco is ready to play its part in making sure we optimize digital tools in Africa into real tools that can power the continent’s development,” he said. Technology can transform Africa by increasing competitiveness, promoting strong integration, reducing the cost of doing business and strengthening trade, among other things but safeguards and a solid foundation needed to protect the continent and its people, added Mr. Zouhair Chorfi. The conference features plenary sessions on a series of sub-themes and at least 16 side events on various issues affecting African economies. The annual Adebayo Adedeji Lecture – named after ECA’s longest serving Executive Secretary, Professor Adebayo Adedeji, who passed away last April, is also on the cards with discussions involving experts from within and outside the continent. Prof. Adedeji, a scholar, thinker and activist who was passionate about Africa’s development, is greatly respected for his leadership and contribution to changing the discourse of Africa’s development agenda.